Join the original and the best celebration of Motown’s greatest hits with the spectacular, critically acclaimed West End hit Dancing in the Streets, which will be parking itself at the Victoria Theatre on Saturday May 28, as part of a nationwide tour. 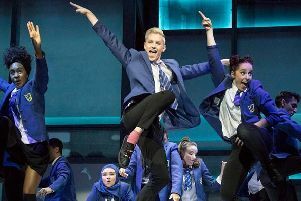 Experience the energy and electricity of the motor city in a stunning production packed with hit after hit - all killer, no filler as The Guardian newspaper put it! The talented cast - Julian Cannonier, Scarlet Gabriel, Emma Louise Jones, Newtion Matthews, Joseph Noble, Joanne Sandi and Wayne Withers - and band - will bring to life the infectious, melodic, foot-tapping songs with a touch of soul and style guaranteed to havethe audience dancing in the aisles. Expect to hear your favourite songs made famous by The Four Tops, The Temptations, Stevie Wonder, Marvin Gaye, Lionel Richie, The Supremes, Smokey Robinson & The Miracles, Martha Reeves & The Vandellas and many more. lMotown derives its name from “Motor City”, the nickname for Detroit where the label was founded. At the time the biggest car manufacturer, Ford was based here. Berry Gordy Jr, the label’s founder once worked for the Ford plant. lStevie Wonder is the only artist from Motown’s heyday still signed to the label. lThe first headquarters for “Tamla Records” (later incorporated into Motown Record Corporation) was a property bought by Gordy in Detroit and known as “Hitsville USA”. lOriginally, Gordy wanted to call the record label “Tammy Records”. Unfortunately, the name was taken, so he chose “Tamla Records” instead. Outside of the US, the label operated under the name “Tamla Motown”.